How to remove hyperlinks from PDF? Question: I have this PDF document which has a picture on it and when you click it takes you to the website , how to I edit or completely remove it. Do you guys have solution? Answer: According to your needs, maybe you can have a free trial of VeryPDF PDF Editor, which can be used to edit hyperlinks casually. In the following part, I will show you how to use this software. Download PDF Editor and install this software by double clicking the exe file. During the installation, please follow installation message and choose the right option according to your needs. Once the installation finishes, there will be an icon on the desktop. Please launch this software by double clicking the icon. The following snapshot is from the software interface. Please click option Open to add PDF file to software interface. Or you can simply drag PDF file to software interface. Please find option Edit Link then click it. The mouse will turn to cross. Please drag area around the picture which will lead you to website. Then there will be red rectangle frame around it. Right click the red frame and choose Property in the dropdown list. Then you will see the dialogue box like I showed in the left named Link Properties. Here you can set link actions, like open a page in a document, open a file or open a website file. Those options are useful when you need to add hyperlinks. Meanwhile it is helpful when you need to remove hyperlinks. If there is link on the image, the link will be shown on the Property tab. Please simply remove it here and then click button OK to back to the main interface. By this way, the link will be removed successfully. Now let us check the remove effect from the following snapshot. The link has been removed successfully. 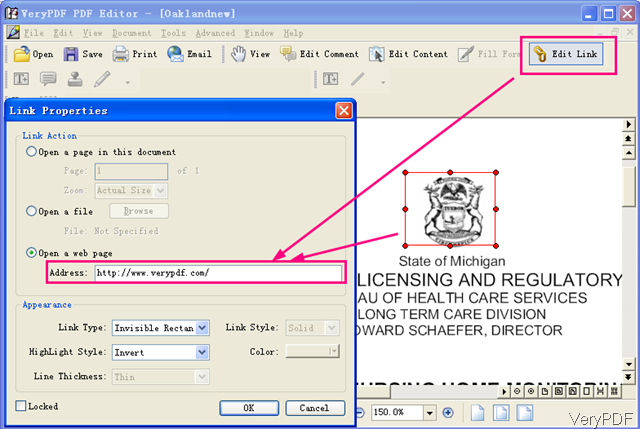 When you need to edit the links in batch, pleas use Batch PDF Editor Tool. Please click Start and then find PDF Editor in Program. In the sub folder, you can find option of Batch PDF Editor. Please launch it and add the PDF files into its software interface. Next please click Option and go to Hyperlink tab then you will see the following snapshot. Please choose the options of Detect names of file with path and convert them to PDF link and others stated here. By this menu tab, you can edit hyperlinks in batch. When you finish setting, simply click button OK to back to the main interface and then click button Start the process PDF file. PDF Editor provides two ways to process hyperlinks in PDF. During the using, if you have any question, please contact us as soon as possible. 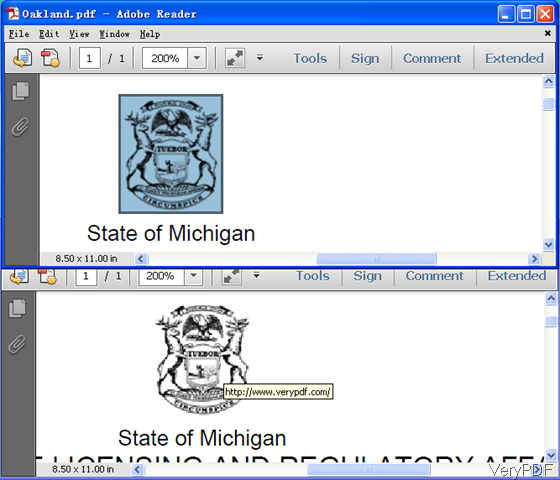 How to specify margins when using PDFprint for printing? How to convert a file of htm to bmp? How to view XPS within Iframe without file size limitation? I need more pages of a pdf file to edit, but only one page of the pdf file is available, is there some way to solve by use of verypdf pdf editor? How to modify the text contents in PDF page? How to change the note into another one when add it to a PDF file with VeryPDF PDF Editor? This entry was posted in PDF Editor and tagged remove hyperlink. Bookmark the permalink.